The Ready, Set, Go box is such a great box for your growing grasshopper! This subscription is full of educational toys and tools to help mold those young minds, perfect for kids 3-5 years of age. All the items involved are great to bring on a road trip, out to a restaurant or just for home! It’s filled with toys, activities, crafts, snacks, treats and is perfect and age appropriate and will keep you kid busy for hours! What’s great is that you don’t need anything else like scissors or glue, everything is included right in the pack! They’re also coming out with boxes for the 1-2 age and 5-7 age group which is a great idea based on how well this box was put together! What’s in this box? 1. Wikki Stix and the Book of Wiggles, Squiggles and Curlicues – This was a favorite of ours. We’ve never tried Wikki Stix but I see them everywhere. They are so fun to use, and safe! You can mold them into anything, we made bracelets, cars, crowns, balloons, the opportunites are endless for that growing mind! 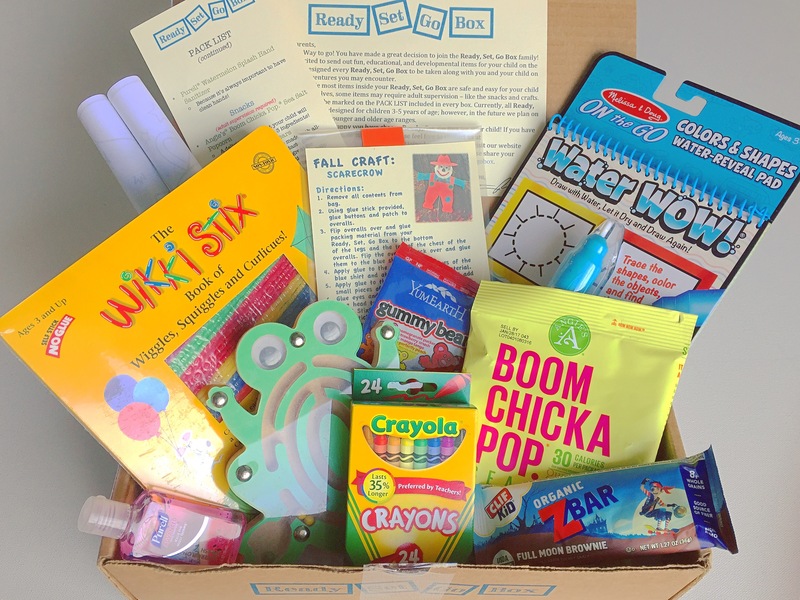 Plus it comes with the book which requires you to add the wikki stix right on the page, perfect way to interact with your little one, suuuuuch a good idea for a long plane ride or restaurant visit! 2. Melissa & Doug water wow! – Westy has one of these books and loves them, just add a little water to the pen and write on the book for the colours and images to appear! Great reusable book! 3. Magnetic Maze – Cute turtle maze that kept Westy guessing and trying over and over! 4. Crayons – Can never have too many, kids love to colour! 5. Coloring pages – Gotta have some colouring pages! 6. Fall Craft – This month is making a scarecrow! We liked making this, came with the glue and everything! 7. Hand Sanitizer – love this watermelon scent, can always use some of this! 9. YumEarth gummies – All natural yummy gummies! 10. Clif Kis bar – such a good whole grain bar! This is their first box and is fantastic, Westy is 3 and it was perfect for him. He loved everything in it, want this box? Sign up before Nov 15th and you’ll get it! Next month is the winter themed box! You have the option of personalizing your box to, with their name written on the front which makes your little one feel even more special! Don’t miss out on this box, definitly one of the best I’ve seen for kids. Such great quality and ready to go!